MacAskill’s argument rests on two concerns. His first is “that it encourages a culture of great praise for small gifts.” He suggests tactics like the ice bucket challenge are “undermining a charitable attitude according to which there are serious problems in the world that desperately need our help, and that won’t be solved by a garbage pail, a video camera, and some frosty water.” It’s a strategy for donors to feel good (and get a little attention and props), rather than doing something more serious. Davidson also mentioned the somewhat negative structure of the campaign, that if you choose not to donate, you dump a bucket of ice water on your head. “The challenge even seems to be suggesting that being cold, wet, and uncomfortable is preferable to fighting ALS,” he noted. 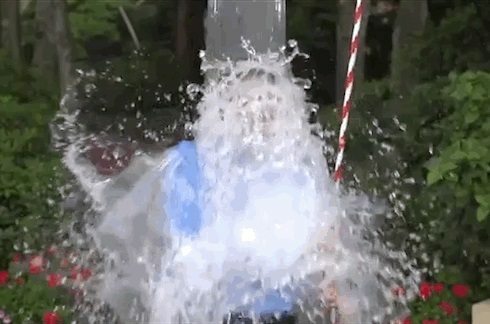 If the strategy of dumping cold water was meant to increase awareness of the disease, the strategy has a built-in contradiction: “ALS needs all the awareness it can get, but somehow I doubt many learned a whole lot from contextless tweets of wet celebs smiling and laughing,” he added. “It’s hard to shake the feeling that, for most of the people posting ice bucket videos of themselves on Facebook, Vine, and Instagram, the charity part remains a postscript. Remember, the way the challenge is set up, the ice-drenching is the alternative to contributing actual money. Some of the people issuing the challenges have tweaked the rules by asking people to contribute $10 even if they do soak themselves. Even so, a lot of the participants are probably spending more money on bagged ice than on ALS research. Writing for the Guardian, Suzanne McGee addressed the various criticisms, particularly the notion that giving to ALS as a result of the ice bucket challenge isn’t sustainable and takes away from other worthy, but less fundraising-creative charities. “Alas for our society: as you can see by the booming donation numbers, we’re programmed to respond to just this kind of stunt,” McGee wrote.